Choosing a hybrid cloud provider is arguably more difficult than evaluating private or public cloud offerings. To make things a bit easier, here's how the top six hybrid cloud providers compare. Deciding on a hybrid cloud provider has additional challenges over a public or private cloud offering. When you are looking at a private or public cloud you compare features and functionality based on one environment. However, with a hybrid cloud you have to look at the solution provided in both your environment and what is external to your environment. Having transparency between internal and external resources does not require the performance to be a mirrored as the hybrid cloud should be viewed as an extension of the internal resources. However security, SLAs and management should come as close to mirroring your internal environment as possible. Last time we looked at the major purchasing considerations for enterprises choosing a hybrid cloud solution; today we compare the top six options when it comes to hybrid cloud offerings from Microsoft, VMware, Amazon Web Services, Rackspace as well as EMC and HP. 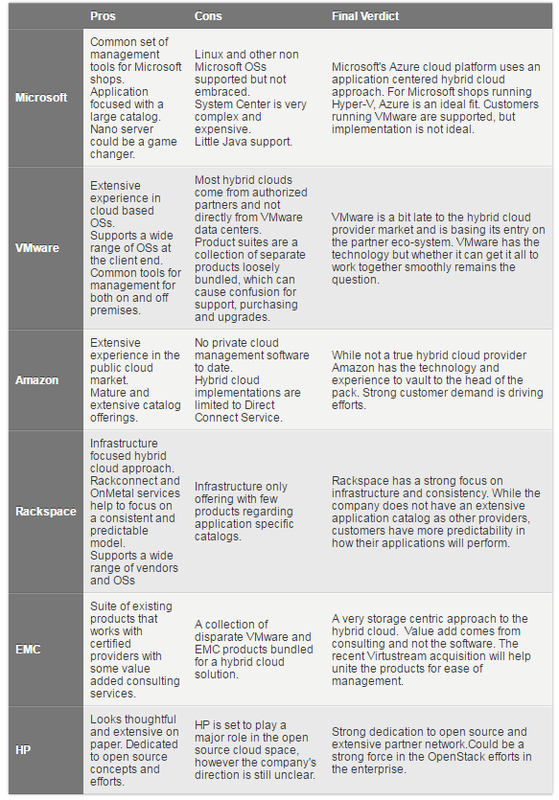 The comparison table that follows includes the pros and cons of each hybrid cloud solution. Microsoft has spent considerable resources in expanding its Azure cloud. While Azure has seen some initial growing pains, it's clear that Microsoft learned from the experiences of its competitors to avoid some common mistakes. The foundation of Microsoft's cloud offering is Windows Server 2012 R2 with System Center 2012 R2. By leveraging a common product suite, Microsoft maintains a level of consistency as workloads move from internal to hybrid cloud environments. This strong Windows focus does not mean that your internal and external clouds cannot run Linux virtual machines or Docker containers, they are supported; but in a Microsoft environment the Windows operating system is of course ideal. Using consistent product families allows for administrators to come up to speed quickly, since the toolsets are the same. However, this is only true if System Center is already deployed internally and staff is trained, which can be a challenge since it incorporates multiple products including Virtual Machine Manager, Data Protection Manager, Endpoint protection and Operations Manager. Security is leveraged off of existing Active Directory infrastructure and provides a transparent security management environment. However, this can open up additional security risks based on existing Windows Server vulnerabilities. Azure is ideal for Microsoft shops because multiple products, including SQL, Active Directory, the .Net platform and other Microsoft applications and services are available in Azure today. The Azure catalog continues to grow and expand as well. This will help to increase the transparency between internal and external resources with a large application catalog. Project Lightwave (for access management) and Project Photon (for Microsoft Linux containers) will allow for more compatibility with existing container technologies and will find a home in the hybrid cloud solution. Lightwave and Photon are designed to catch-up with existing container technologies where Microsoft Nano Server is a more radical but welcome innovation. Nano server is a minimal installation of Windows Server designed for the cloud and developers. This level of portability with Windows applications in containers that can be moved easily within the hybrid cloud is what the Windows developers have been looking for since containers were first introduced. VMware's products were one of the first cloud operating systems. VMware was able to use its established record of performance and reliability to become a good choice for many cloud providers. However, VMware did not get into the cloud provider space until a very short time ago. This puts the company a step behind many of the other cloud players in terms of experience, however in many cases VMware still has a technology edge over other providers. VMware has the experience and technology to power many of the world's biggest virtualized deployments. However, VMware suites are often a collection of products loosely bundled together that can contribute to confusing purchasing, installations and upgrades. Frequent product name changes don't help this situation either. VMware vCloud Air is vendor agnostic when it comes to running Microsoft, Linux or other operating systems. This wide base of support treats all vendors the same and provides a consistent platform that is best suited to multiple operating system environments. VMware uses the same vCloud software for both the internal and external cloud frameworks. This helps to keep transparency for the administration of resources. Additionally, VMware is one of the few providers with multiple years of experience in software defined networking (SDN) and brings that experience to the hybrid cloud in its NSX product. What's important to note is that VMware is not the sole provider of its hybrid cloud; in most cases, vCloud Air is available through a partner network that is certified to run VMware's vCloud Air Network Services. This may be a concern for some who did not realize vCloud Air is not a dedicated VMware data center. VMware's hybrid cloud supports a wide range of resources, however it resides closer to the infrastructure layer where some of the other providers can dive a bit deeper into the application layer. Container technology will help to bridge this gap, but not completely close it. Amazon Web Services does not have a hybrid cloud service, as compared to the other providers on this list. AWS has taken a different approach, but one that still warrants review due to the sheer number of businesses and sites utilizing AWS in a hybrid environment. AWS remains focused on the public cloud and currently does not offer its cloud management software offsite. 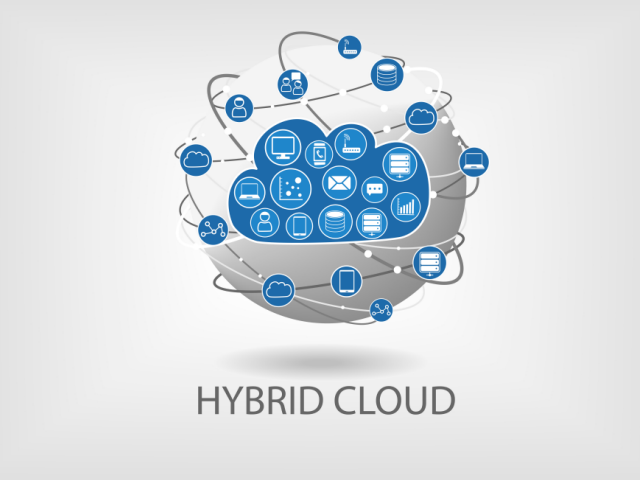 Instead, the hybrid approach uses a Direct Connect Service that bridges the customer's data center with a virtual private cloud (VPC) resource. As one of the largest public cloud providers, AWS has the resources and experience to manage the hosted side of a hybrid cloud. Currently the company lacks the private aspect needed at the customer's site. Direct Connect is not a private cloud management package, only a connection from a VMware or Microsoft's internal cloud. While Amazon is not a hybrid cloud by traditional definition, the company has been making some steps in that direction with the AWS GovCloud program that uses AWS for onsite private cloud with the U.S. government. Whether or not this makes it to the private sector remains to be seen. AWS is the unknown in the hybrid cloud field. Today AWS customers continue to ask for private cloud management and have had to make due with third party offerings while patiently waiting for Amazon to fully embrace the hybrid cloud. Rackspace approaches the hybrid cloud with the flexibility of a Swiss Army Knife for infrastructure. Rackspace provides the connection from on-premises resources to offsite through the use of its Rackconnect technology. Rackconnect allows the consumer to seamlessly scale out the environment as needed by adding Cloud Servers or Cloud Files. While offering both single and multi-tendency, Rackspace has a strong single-tenant model with the OnMetal Cloud Server offering to ensure consistent and predictable application performance. Rackspace also has a strong focus on infrastructure with a dedicated high performance hardware option in a flexible and scalable model. Hybrid cloud deployments are based on OpenStack. EMC has built its hybrid cloud through a combination of methods including partnerships, acquisitions and internal development. Because of this "best in breed" approach, EMC provides a hybrid cloud that is closer to an overlay of other software, such as VMware vRealize suite combined with EMC software (ViPR, PowerPath and Storage Analytics).These solutions can be run internally or on top of other certified service providers such as AT&T, Terramark, Rackspace and VMware. While the best in breed approach can be a bit confusing, EMC recently acquired Virtustream, a hybrid cloud management platform, which has the ability to unite several of the best of breed products under a single management interface. Where this fits in with VMware vCloud Air is yet to be seen as both solutions could compete with each other. HP has a full hybrid cloud portfolio, part of which is based on the company's open source Helion Eucalyptus platform designed to be compatible with AWS. The core, however, is based on OpenStack technology. This puts HP right in the competitive field with the other vendors using OpenStack as a foundation. HP does have a few advantages over the competition however, including deep partner relationships that can be leveraged in the hybrid cloud, along with a public commitment to open source for the hybrid cloud. With so many companies looking at open source tools and OpenStack in particular, this may position HP in a leadership role if it continues to embrace the open source mindset and toolsets.